Holy Cow, It’s going to be December! Where has the year gone? I can’t believe it’s going to be December tomorrow! In some ways it feels like it’s gone be really fast and others it feels like it’s will never end! I swear when I was young, time moved so slow. But after I graduated from high school, time just seems to fly by. So my goal for December is to post in my blog, make an appointment to see the doctor, dentist and get new glasses. Let’s see if I can do all of this one the last four weeks of 2010! I will remember him from his role in The Poseidon Adventure and the Airplane! movies. 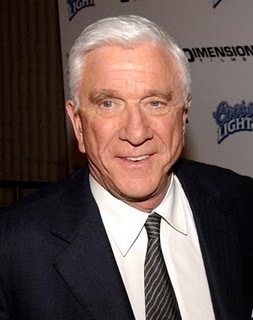 Legendary funny man Leslie Nielsen died today of complications of pneumonia in a hospital near his home in Fort Lauderdale, this according to his agent. He was 84. I was renewing my subscription to Rolling Stone magazine and found this on their website: Fifty Artists Pick Their Personal Top 10s. Fifty top artists talk about the music they love the most: Rolling Stone reveals their playlists over five weeks, from Mick Jagger on the Blues to Drake on Jimi Hendrix. I love playlists and I like adding them to my iPod. Here is a list from Annie Lennox. It’s transcendent. When I first heard this, I sang it over and over and couldn’t stop. Her voice had such subtle nuances. Karen’s singing was so stylized but so natural. Dionne Warwick’s sound is like coffee with cream: smooth, but with an edge. So uplifting, and their harmonies couldn’t be beat. Like honey on a stick. It’s about hunting whales, and it’s chilling. It makes downtown sound like a mythical wonderland. Those choruses build up and just take off. Out of all these songs, I think my favorites are “Close to You” and “I Say a Little Prayer”. I’m going to be checking out the playlists that are added to the Rolling Stones website. Well, the end of the four-day weekend is coming to an end. It was a pretty good one. I was around family for Thanksgiving and it made it a a little easier not having my mom here. Then there was my road trip to Corpus Christi, Padre Island and Port Aransas. It was nice and sunny driving on the beach and nothing to do. I will need to do this again in a couple of months to regroup myself. Sunday was a quite day. This afternoon we had our Thanksgiving dinner. We had my aunt over. It was OK, but I don’t know when I will ever feel the same about it without my mom here. “The Wizard of Oz” was on, one of my favorite movies ever. Then there was a Hallmark movie, “November Christmas” on staring Sam Elliott and John Corbett… hubba hubba!! As with all Hallmark movies, I cried! But I think I cried more at the Hallmark commercials! They get me every time. Thank goodness the next Hallmark movie is not until February. Also on TV tonight was ” The Walking Dead”. I keep coming back to watch this show. There is something about it that keeps my want to watch more. I’m even thinking about reading the comic book it’s based on. I am on a mission to collect license plates from all 50 States for my dad. He started collecting them and has about 12-15 States so far. Let see how far I can get by Christmas. I found some old friends on Facebook. I think I have found like 10 people that I grew up with on the street we lived on in Flint, Michigan. I have loved finding old friends on this site. Wondering what this upcoming week has in store. Today I am taking my annual (as of last year) road trip to Corpus Christi, Padre Island and Port Aransas, Texas. This is the third time that I have taken this road trip. The first was in January or February of 2008. It was my first time at the coast and seeing the Gulf of Mexico. I had blast. It was the first time that I drove on the beach too! I stopped at this dive of a restaurant on the beach called the Beach Lodge. I had the Texas Seafood Boil. I spent the whole day there just drving up and down the beach. The second time I went there was with my cousins, Becky, Jasmine and Camryn when they came down for a visit last year. Our road trip was the Saturday after Thanksgiving and it was a beautiful sunny November day. First we went to Padre Island and drove on the beach to Port Aransas, And we had dinner at the Beach Lodge. It was another great road trip to the coast. This road trip is the first time I have gotten away for a weekend since my mom died in January. I just felt the need to get away from my regular routine at home. The drive down was good. It was sunny and in the mid-50’s. I drove through downtown Corpus Christi, along the Shoreline Drive. There were some very nice houses along the coast. 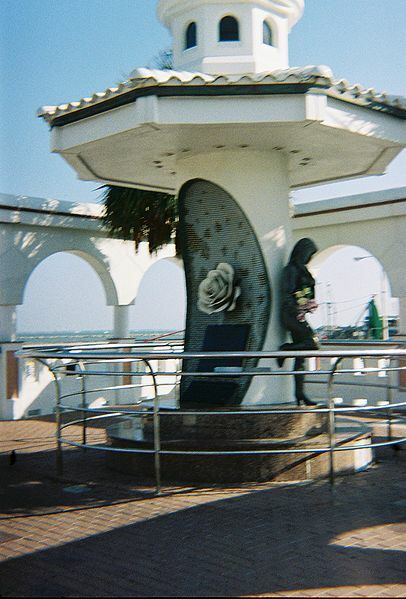 I finally saw the tribute to Selena that is near the marina. Like my past road trips, I had dinner, the Texas Seafood Boil at the Beach Lodge. I decided to spend the night in Port Aransas so I can spend most of Saturday morning/afternoon driving on the beach. It’s suppose to be in the 70’s and sunny, so its going to be a great day to be driving on the beach. I love it when I come to Corpus Christi, Padre Island and Port Aransas. The time alone gives my time to think and sort things out. I’m looking forward to the sights that I’m going to see on Saturday. Nothing but the wind, sun and the waves of the Gulf of Mexico. Hope everyone had good Thanksgiving. Saw this and thought it was interesting. During the mid-1800s, poet and editor Sarah J. Hale began lobbying for a national Thanksgiving holiday. In 1863 President Abraham Lincoln gave his Thanksgiving Proclamation, declaring the last Thursday in November a day of thanksgiving. At one time, the turkey and the bald eagle were each considered as the national symbol of America. Benjamin Franklin was one of those who argued passionately on behalf of the turkey. Franklin felt the turkey, although “vain and silly”, was a better choice than the bald eagle, whom he felt was “a coward”. As long as I can remember my mom made her Green Jell-0 for Thanksgiving. This will be our first Thanksgiving without her here with us. So I wanted to keep the tradition alive and try to make it. The first problem I encountered was, I failed to pay attention to my mom whenever she made it. I knew all the ingredients that were in the green jell-o, but not how to make it. Second, I thought I could Google it and I could find it. Well, what I found was hundred of thousand of green jell-o salads. But none where my mom’s. So then I texted my sister, Cynthia and she had her old recipe card she made in 1994 of our mom’s Green Jell-O! I was so happy that she took the time to write down our mom’s recipe! So tonight, I made the green jell-o. It looked and smelled like when my mom made it. The real test is how it tastes! Hopefully I did my mom proud and it half as good as hers. Here’s my my recipe for her Green Jell-O… Desert? Salad? Whatever it’s called. All I know it is good and it reminds me of my mom. Thanks to my sister for the recipe. I love you mom and miss you more than I can say! add 1 cup boiling water. Stir for 2 minutes. Mix in one 8 oz package cream cheese – break into small bits. Drain juice from one can of crushed pineapple – save juice and combine with 7-Up to make 2 1/2 cups. Add 1/2 chopped pecans (or more 🙂 and mix well. Chill until firm.